Maccaferri Terramesh is a versatile, modular system for reinforced slope systems and mechanically stabilised earth walls that can be a more cost effective solution than the mass gravity Gabion wall because of the speed of installation and reduced rock fill requirements. For mechanically stabilised earth slopes and embankments that require vegetation, the front face of Maccaferri Green Terramesh can be filled with soil and planted, creating a green slope. 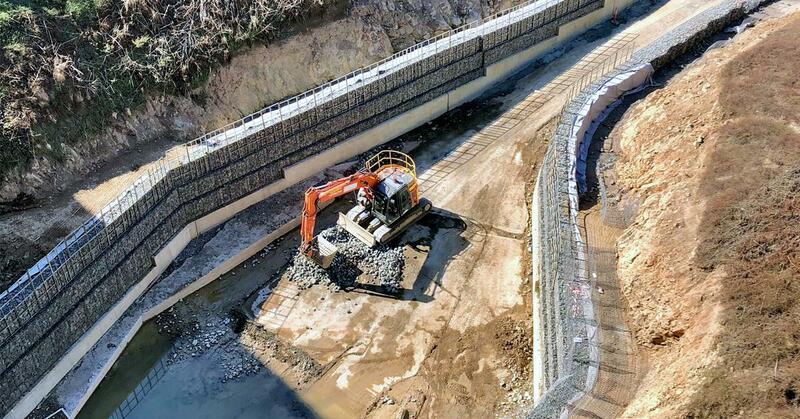 The Maccaferri Terramesh retaining wall system is designed for use in a wide range of applications in road, mining and rail infrastructure works. The Maccaferri Terramesh system comprises of a gabion type facing with integral woven mesh soil reinforcement panels that can be used to construct structures with either a stepped front face or vertical facing. Maccaferri Terramesh are pre-assembled units of double twisted wire mesh. The facing section of the unit is formed by connecting a back panel and diaphragms to the main fascia unit, thus creating the rectangular shaped cells used for stone confinement. The geogrid reinforcement, fascia and lid are all one continuous panel of mesh. Terramesh System units are supplied in standard lengths, requiring no cuts on site. 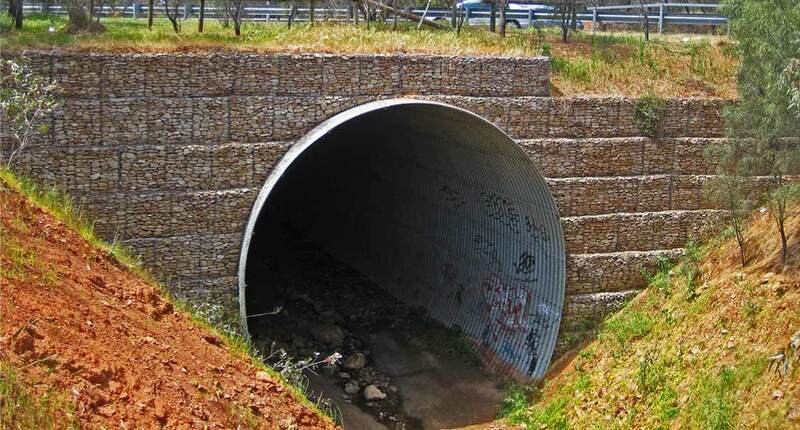 They can be used individually or combined with geogrid reinforcement for the stabilisation of soil slopes in a wide range of applications including slip repair work, steep slope construction in both residential and road infrastructure works as well as in specialist applications such as noise barriers and rockfall bunds. Green Terramesh soil reinforced slope structures can exceed 50m in height and can be used in a wide range of engineered soil types. Green Terramesh structures allow for geogrid to be terminated at the face minimising the risk of exposure of the geogrid to UV, fire or vandalism. Both the Maccaferri Terramesh and Green Terramesh systems have independent technical approval. 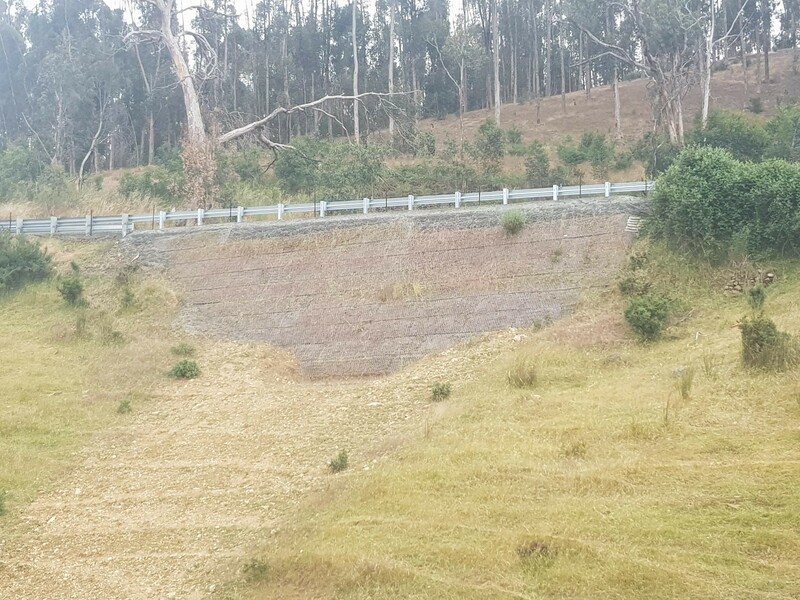 Maccaferri Green Terramesh units provide a permanent formwork in the front face of reinforced soil slopes as well as contributing to the overall stability of the structure. The front face is normally soil filled and planted to achieve vegetated solution however where required rock can be used in the front face. This versatility along with the construction and technical advantages offered by Green Terramesh have seen the widespread use of this system throughout Australia and New Zealand. The fixed face angle and vertical lift simplifies construction of the reinforced soil slope. When combined with geogrid, Terramesh and Green Terramesh structures can exceed 50 m in height. Maccaferri Terramesh features a Galmac coated wire mesh, protected by a polymeric barrier made of PVC. This improves corrosion resistance and enhances the system’s durability. Maccaferri Terramesh has a permeable front face to allow drainage of the backfill. It is structurally safe in the face of fire and reduces environmental impacts by incorporating vegetation on the front face. Maccaferri Terramesh is quick to install and tests have proven its durability and strong performance in coastal applications. The Maccaferri Green Terramesh system has independent technical approval. To support design of retaining walls, slopes, embankments, hydraulic structures and rockfall protection we offer an advanced suite of software free to our clients. Terramesh and Green Terramesh units used individually or with geogrid in reinforced soil slope construction. The backfill used with Terramesh is generally an engineered fill suitable for use on most earthworks sites. A maximum particle size of 75 mm is recommended to limit installation damage to the mesh coating and geogrid reinforcement. A 300 mm to 500 mm zone of topsoil is placed up against the geotextile in the front face to provide a growing medium for the selected vegetation. Rock can be used in place of topsoil to line the face in areas subject hydraulic action or where a rock feature is required. bidim geotextile is used at the interface between the gabion rock and backfill. Pneumatic lacing tools are available for hire from your local Geofabrics office for use with woven mesh systems. These tools have been shown to halve assembly time. We also sell lacing rings (hog rings), lacing wire and preformed bracing wires that create a straight face and speed up the installation process.